Loews Corporation is a diversified holding company with most of its value attributed to majority stakes in three publicly traded subsidiaries: CNA Financial, Diamond Offshore, and Boardwalk Pipeline. Based on market quotations at the close of trading on March 9, the value of shares owned by Loews in these three public subsidiaries was $14.7 billion. With Loews Corporation’s market capitalization at $15.3 billion, investors are paying less than $600 million for the rest of Loews, referred to in this article as the “Loews stub”, which had tangible book value of $3.7 billion as of December 31, 2011. The Loews stub includes wholly owned subsidiaries HighMount and Loews Hotels along with cash and investments at the holding company level. Given the current relationship between Loews stock price and the quotations for the three publicly traded subsidiaries, market participants are effectively saying that the intrinsic value of the stub is a mere 16 percent of tangible book value. Either Mr. Market’s adding machine is broken or there are serious problems with the stated tangible book value of the Loews stub. Loews may suffer from the perception that it is an unwieldy conglomerate with a complex structure making it difficult to fully understand the factors that make the overall company tick. However, investors have the advantage of market quotations for CNA Financial, Diamond Offshore, and Boardwalk Pipeline as well as detailed financial statements filed with the SEC by these subsidiaries. Although intelligent investors can never take market quotations alone as a reliable indicator of intrinsic value, in the case of Loews we can use these quotes to understand what value the market is implicitly placing on the parts of Loews that are wholly owned. 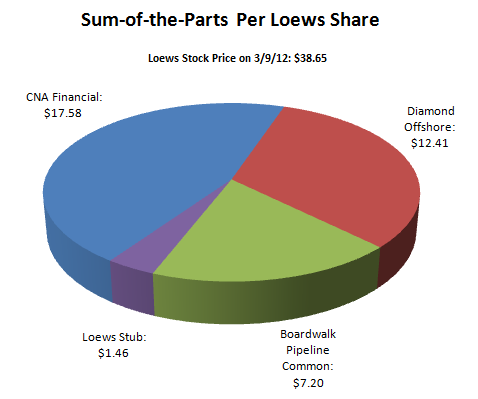 For each share of Loews purchased at $38.65, investors are effectively receiving $37.19 worth of stock in CNA Financial, Diamond Offshore, and Boardwalk Pipeline common units at current market prices and paying an additional $1.46 for the Loews stub. The question of whether CNA Financial, Diamond Offshore, and Boardwalk Pipeline common units are undervalued, overvalued, or fairly valued is an important consideration for an investor contemplating a purchase of Loews common stock. While our analysis of each of these companies makes us comfortable with recent market quotations, this article will not attempt to provide intrinsic value estimates for CNA, Diamond Offshore, or Boardwalk. Instead, we will focus on whether the implied value of $580 million, or $1.46 per Loews share, is a reasonable value to assign to the Loews stub given the stub’s tangible book value of $3.7 billion, or $9.35 per Loews share. What’s in the Loews Stub? The Loews stub, as we define it, includes all sources of value within Loews Corporation that are not attributed to holdings in CNA Financial, Diamond Offshore, and Boardwalk Pipeline common units. As noted previously, the implied valuation of the stub is currently $580 million based on taking Loews market capitalization and subtracting the value of the stakes in CNA, Diamond Offshore, and Boardwalk common units. Loews provides segmented balance sheets and income statements that allow analysts to understand the economics of the stub more clearly. The company provides three main categories for the stub: HighMount, Loews Hotels, and Corporate. Corporate includes net cash and investments held at the parent company level, 22.9 million Boardwalk Class B units, the Boardwalk Pipeline general partner interest and Boardwalk subordinated debt. In total, the stub had tangible book value of $3.7 billion as of December 31, 2011. We will take a brief look at each component of the stub with the goal of assessing whether stated tangible book is reasonable. We spend most of the discussion on HighMount given our belief that this subsidiary’s value alone far exceeds the market’s implied value for the entire stub. HighMount is engaged in the production, exploration, and marketing of natural gas, oil, and natural gas liquids. The company’s proved reserves are mostly located in the Permian Basin in West Texas. The company was founded in 2007 based on an assumption of assets from Dominion Resources for approximately $4 billion. The following exhibit provides a summary of HighMount’s results since inception. As of December 31, 2011, HighMount had total shareholders’ equity of $2,032 million and tangible equity of $1,448 million. As we can see from the exhibit, HighMount has taken substantial impairment and goodwill losses over the past few years. The impairments were due to a combination of reduction of reserve estimates and the impact of lower natural gas prices on the present value of HighMount’s estimated reserves. HighMount follows the full cost method of accounting (as opposed to successful efforts) and capitalizes all direct costs of property acquisition, exploration and development. Depletion charges reduce the capitalized amount based on the units-of-production method but failure of impairment tests can result in charges as was the case in 2008 and 2009. 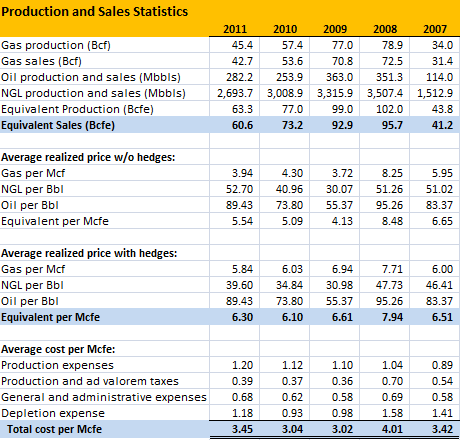 HighMount’s production and sales statistics are provided in the exhibit below. We can see that the company has been able to partially mitigate the decline in natural gas prices over the past few years through hedging activity. However, with natural gas prices recently under $2.50/mcf, it is likely that revenues will be adversely affected this year and further impairments may be likely. Obviously, the ultimate value of the company’s reserves will depend on the price received for natural gas, oil, and natural gas liquids over a long period of time. HighMount expects to spend $320 million in capital expenditures in 2012 to develop natural gas and oil reserves with a focus on liquid rich and oil drilling opportunities. The focus on oil and liquids, if successful, would increase the proportion of reserves attributable to liquids and result in a more favorable outlook if natural gas prices remain at historically depressed levels. In light of the low level of natural gas prices, we find it prudent to disregard the value of HighMount’s goodwill and focus on tangible book value of $1,448 million as of December 31, 2011. It is possible that HighMount will be forced to write down the value of natural gas related properties in 2012 if natural gas prices remain at very low levels. Loews Hotels currently operates seventeen luxury lodging facilities located in the United States and Canada with a combined total of 7,641 rooms. The hotels range from business oriented lodging to family resort destinations and are generally regarded to be upscale. 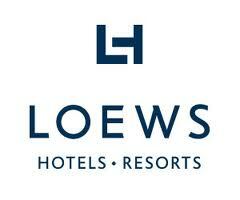 As of December 31, 2011, Loews Hotels had total equity of $194 million, of which $191 million was tangible equity. We can see that the company has posted improving results since the recession although key metrics such as revenue per available room and occupancy rate have yet to fully reach 2007-2008 levels. Although the company is still posting sub-optimal returns on capital, it does not appear unreasonable to believe that the vast majority of the $191 million in tangible book remains intact. Indeed, if net income rises to 2007-2008 levels, $191 million may significantly understate the intrinsic value of this business unit. 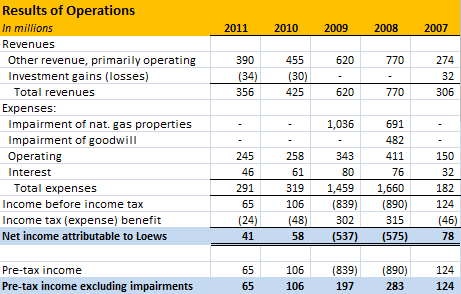 Loews carries substantial cash and investments at the holding company level and has a multi-decade history of intelligent deployment of capital. As of December 31, 2011, Corporate had $2,071 million of tangible equity. We will discuss the key investments held by corporate to judge whether it is reasonable to believe that this tangible equity exists. In addition to holding 102.7 million common units of Boardwalk Pipeline, Loews also owns the general partner interest as well as all 22.9 million Class B units. Only the value of the common units are reflected in the “sum-of-the-parts” exhibit presented earlier in this article. Although a full discussion of Boardwalk’s business and corporate structure is beyond the scope of this article, we will take a brief look at the economics of the general partner and Class B units. The general partner controls Boardwalk’s operations and has the rights to regular and incentive distribution rights (IDRs). Class B shares have rights to receive up to $0.30 per unit in quarterly distributions. In 2011, Loews received $27.5 million in Class B unit distributions and $30.7 million in general partner distributions including IDRs. The payments under the IDRs escalate based on the distributions paid to common unit holders beyond specified “target” amounts. Substantial future upside for the general partner exists based on Boardwalk’s recent distribution policy. Full details regarding the distribution policy may be obtained in Boardwalk’s 2011 10-K. According to Boardwalk’s 10-K, the general partner’s equity is $62.1 million and the Class B unit holder equity is $678.7 million. We believe that these values are easily justified by the figures presented here and in conjunction with a more complete review of Boardwalk’s SEC filings which we encourage interested readers to pursue. In addition to investments in the capital stock of public and private subsidiaries and the Boardwalk general partner and Class B interests described above, the holding company also holds a substantial investment portfolio. Current assets of the holding company, which were principally in short term instruments, was $2,267 million as of December 31, 2011. In addition, the holding company balance sheet shows $1,140 million of investments in securities which would include the Boardwalk general partner and Class B interests described above. The holding company had $1,467 million in liabilities which included $694 million in long term debt, $233 million of current liabilities, and $540 million of deferred income taxes. Although there is limited transparency regarding the specific investments in the portfolio, there appears to be no reason to substantially discount the tangible book value related to the investments made at the holding company level. Overall, we believe that the tangible book value attributed to the corporate holding company is well supported. Is the implied valuation of the “Loews Stub” reasonable? We believe that the answer to this question is a definitive “no”. The market is placing an implicit valuation of $580 million on a group of businesses and investments with a stated tangible book value of $3.7 billion on the Loews balance sheet. Mr. Market’s implied valuation asserts that Loews has seriously overstated the value of these businesses and investments. However, the value of HighMount alone clearly far exceeds the market’s valuation of the entire stub. One could stop right there if the only goal is to determine whether the market’s implied valuation is correct. However, by also looking at the value of the Boardwalk Pipeline Class B and general partner interests along with Loews Hotels and other corporate investments, it becomes abundantly clear that most if not all of the $3.7 billion in tangible book value is very well justified. In order to own Loews, an investor must be satisfied that the publicly traded common stocks — CNA, Diamond Offshore, and Boardwalk common units — are good values, or at least not grossly overvalued. CNA is perhaps the most problematic given the spotty record of its insurance underwriting in recent years and a pattern of substantial “reserve strengthening” due to underestimating losses in past years. Mitigating this history is CNA’s substantial discount to tangible book value. Investors who wish to gain exposure to the Loews stub but have doubts about CNA, Diamond Offshore, or Boardwalk Pipeline common units can attempt to hedge out exposure to these companies through offsetting short positions. In a theoretical trade where one is long Loews and short proportional shares of CNA, Diamond Offshore, and Boardwalk common units, exposure would be limited to the “stub” itself. However, there are practical considerations that may preclude this option for most individual investors. Just as one does not require a scale to determine whether an obese man is overweight, precision is not required to see that there is something very wrong with the manner in which Mr. Market is pricing Loews stock relative to CNA Financial, Diamond Offshore, and Boardwalk common units. We believe Loews is worth at least its book value of $47.49 per share and perhaps significantly more given management’s proven track record of intelligent capital allocation over long periods of time. Middleburg Financial: The Foundation of Sokol’s “Mini Berkshire”? interest rate risk from CNA (although that should be accounted for in the price of CNA, so penalizing L in addition is over doing it). The Tisch’s seem to run it as a very long-term oriented family business — meaning this year’s or next year’s results are of little importance compared to the long-term wealth maintenance of the Tisch family. I agree with you that L is cheap, and it’s one of my largest holdings. A price move towards an more reasonable value over the next 2-3 years should result in satisfactory returns for shareholders. It’s hard to speculate on the reason for the current weak implied pricing of the stub but if I had to guess, I would say that low natural gas prices are a big part of this. However, as the analysis shows, even if we assume large write downs at HighMount, the value of HighMount alone far exceeds the market’s implied value for the entire stub – meaning that we get Loews Hotels, Boardwalk general partner, Boardwalk class B, and corporate net cash and investments for “free”. Seems like a classic case of market inefficiency – but this can go on for long periods and there have been times in the past where the “stub” traded at a *negative* implied value! I’ve got huge respect for your articles, but on this one I disagree somewhat. The publicly traded subs are not worth 100% of market value to passive minority L shareholder. As Aesop said 2500 years ago, a bird in the hand is worth two in the bush. L has always traded at a discount to its assets, and it probably always will. Second, if the stub is priced at ~$600M and is worth ~$3.7BN, that sounds really great, but in reality you have a ~$39 stock, that is worth at best ~$43 (10% lack of control/conglomerate discount). Hard to get excited about that, esp. with no dividend to speak of. The only way I would think this is a good buy is if the underlying companies have good prospects going forward. I know CNA has been a pig, don’t know much about the others. Loews has traded at a discount to book value in recent years, but that has not always been the case. It actually traded at a premium to book at year-end from 2004 to 2007 based on my records. However, there is no way to know when price will approximate book again, or if it ever will. 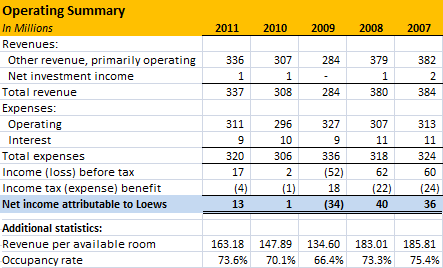 One thing to remember about Loews management is that they actively take steps to maximize shareholder value. Aggressive repurchase programs have lowered the share count substantially – from 435 million at 12/31/08 to 396.59 million at 12/31/11. Also, management’s actions with Lorillard demonstrates that they are willing to pursue spin offs when doing so will maximize shareholder value. So while I realize that a discount is typical, I think it is more in line with what one would expect with poor management rather than capable shareholder friendly management. With Tisch family ownership exceeding 25% of the company, I feel like they are well aligned with passive minority shareholders. OK, I stand corrected on the historical discount point, and you may well be right about the future. I tried this one once before, and kind of got tired of it and sold it. Just curious, if you had new money to put to work, and not considering any diversification issues, would you buy BRK or L? I own both Berkshire and Loews but Berkshire is a much larger position. I believe the intrinsic value of both Berkshire and Loews to be around 30% above current market prices. I also believe that it is likely both Berkshire and Loews could compound intrinsic value at rates between 8-10% annualized over the next decade. Meaning that even once intrinsic value is reached, reasonably good compounding could be expected going forward. However, the major difference involves the quality of the underlying businesses. Berkshire’s subsidiaries are far better businesses and will carry much of the load required to advance intrinsic value. At Loews, I think that management’s ongoing re-allocation of capital is more important in terms of building intrinsic value over time. For example, I would think that at some point HighMount might be monetized (in a more favorable natural gas environment, if one ever arrives) and the funds would be redeployed by management into something new. The same might be true for the general partner and class b boardwalk shares. Another way of saying the same thing is that I believe Berkshire, in its current form, is more likely to compound intrinsic value for a longer period of time that Loews in its current form. But I doubt Loews will resemble its current form in 10 or 20 years. The upside for Loews is a smaller size and more agility, and more willingness of management to spin off units, repurchase shares, etc. Of course, Berkshire will also not resemble its current form in 20 years and Buffett or someone else will have to constantly redeploy the cash flows generated by the current set of businesses. But I view the capital allocation at Berkshire in the long run in terms of deploying free cash flow thrown off by the existing businesses and at Loews I think the businesses themselves may be bought and sold – meaning more capital to allocate and a higher degree of risk involved in intelligent reallocation. Excellent article as always. I’m curious about what deferred taxes Lowe’s may have accumulated on their large positions in CNA, Diamond Offshore, and Boardwalk. I believe they have owned these for years. Were they to be liquidated what kind of taxes would Lowe’s owe? I apologize if this was discussed, but I didn’t see any mention of it. That’s an interesting question. My initial take on it: Since CNA, DO, and BWP are greater than 50% positions, they are consolidated on Loews financial statements and the segmented balance sheet provides each subsidiary’s book value. The shares of CNA currently trade at a discount to Loews’ carrying book value while DO and BWP trade at premiums. I am not sure if the book value Loews carries each subsidiary for equals the tax basis; there is probably some difference. My assumption is that if one of these >50% subsidiaries are sold above Loews’ carrying value, taxes would be owed upon sale. I do not believe that deferred taxes are carried for that possibility, in contrast with <20% positions where deferred tax liability is clearly provided for.